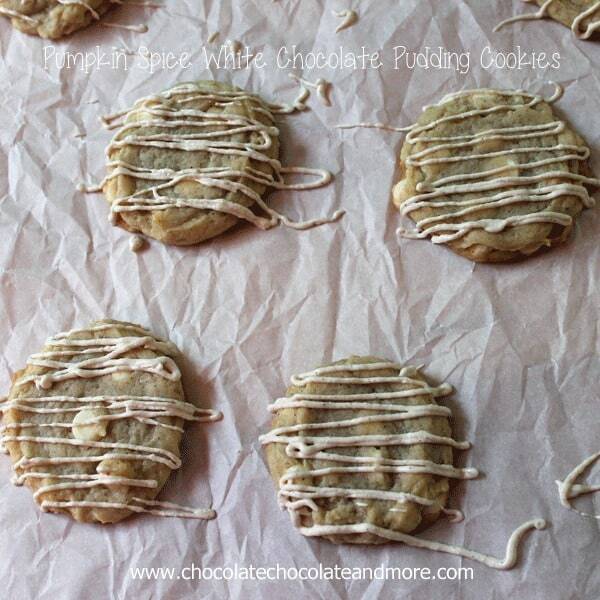 Pumpkin Spice White Chocolate Pudding Cookies - Chocolate Chocolate and More! Let’s talk a few minutes about cookies. Cookies are the ultimate food. Now before everyone gets all out of shape and ready to debate, hear me out. I’m not saying the best or most tasty food. Just Ultimate. Let’s take a look at the virtues of cookies. They are easy to make. Um, yeah, they are. Sure there are levels of cookies that require more skill, but I would dare to say, anyone can make the basic Chocolate Chip Cookie. Drop cookies rule! 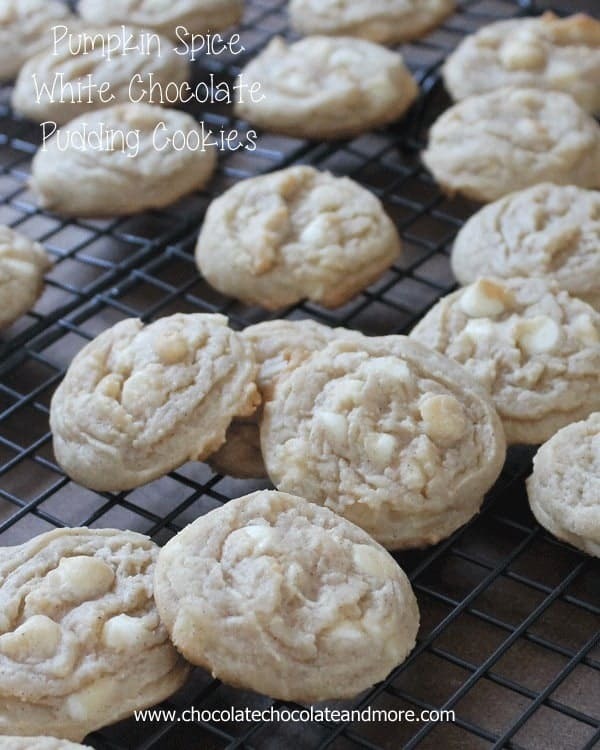 You can make most cookie dough in advance, storing either in the refrigerator or even freezing it for months, allowing for almost instant cookie gratification when the need hits. Ok, it’s probably 15 minutes to that first bite but that’s only because you have to let the oven preheat. 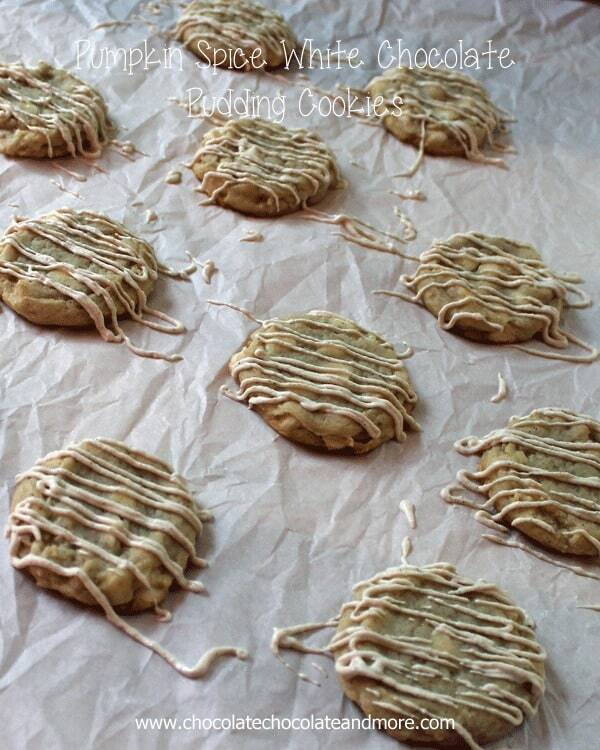 There are endless flavor possibilities for cookies. If you can dream it, I’m pretty sure you can incorporate it into a cookie. And I know, right now someone is thinking what about fish cookies or steak cookies? Gross. Well those cookies wouldn’t be in my dreams but maybe for a cat or dog…so who knows. There is no “season” for cookies. Cookies are year round. Yes there are cookies you prefer at certain times of the year but there’s no shame in eating a Gingerbread Man in June if that’s what you want to eat, Or an Ice Cream Sandwich in January. Within seconds, both hands are in action, faster than a game of Halo, one hand is placing (shoving) a cookie into the mouth while the other hand is stocking up on replacements for that first cookie. You can’t do that with a cake or pie. Travelable. Yeah, it’s an important quality in a house of kids. You can dress a cookie up. There’s nothing wrong with the simplicity of a drop cookie. All my favorite cookies are drop cookies. Yeah, you want some drizzle in your life. I love adding spices to cookies. It can completely transform an ordinary recipe. Cream butter and sugar together. Add eggs and vanilla, cream again. Combine flour, pudding mix, baking soda,salt and Pumpkin Pie spice in a separate bowl then slowly add to butter mixture. Once all combined, fold in chocolate chips. Spoon about a large tablespoon (I use a medium cookie scoop) of dough onto parchment lined baking sheet, placing dough 2 inches apart. Bake in a preheated 350 degree oven for 8-10 minutes. Let cool on cookie sheets for 5 minutes before removing to racks to cool completely. For drizzle, carefully melt chocolate then stir in pumpkin spice. Place chocolate in a pastry bag with a small tip or use a plastic bag with a hole poked in the corner. Carefully holding the bag (remember, the chocolate is hot) drizzle over cookies. Let drizzle cool and set before storing in an airtight container. These cookies passed the travel test several times. I could eat that entire batch of cookies, in one sitting if I had a nice, tall mug of hot coffee. They look phenomenal. I believe the same thing, you know; food shouldn’t be held to a season. Ever. Christiane, these cookies never made it out of the house to share with friends. 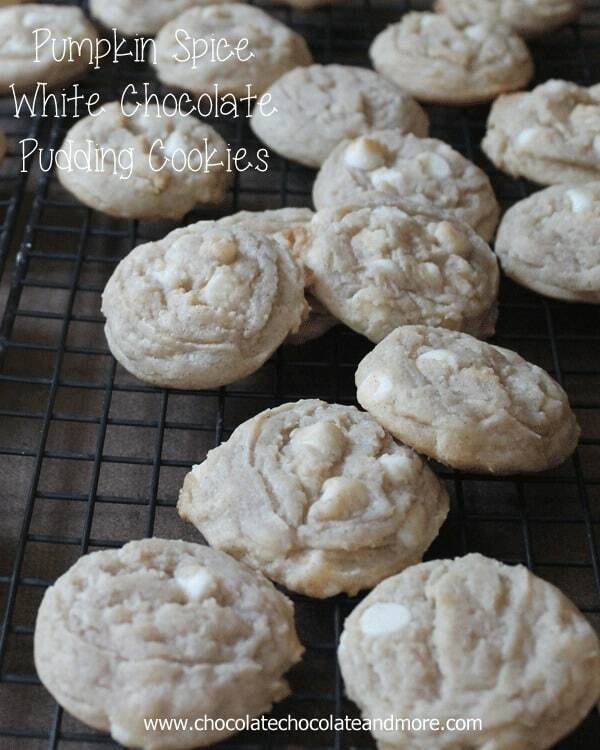 I needed a new cookie recipe to take to our church lunch this Sunday! 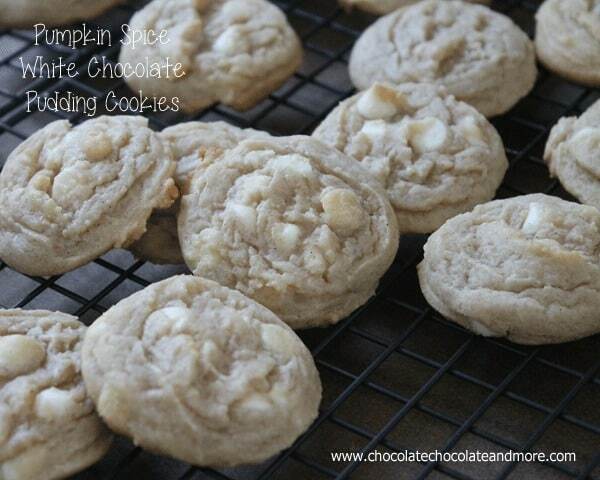 I’m taking the pumpkin spice white chocolate ones. They look dee-lish! these look delicious! do they stay soft and chewy for a couple of days?? Hi Jamie, yes these stay soft. These look amazing! pumpkin and white chocolate are a great combination. 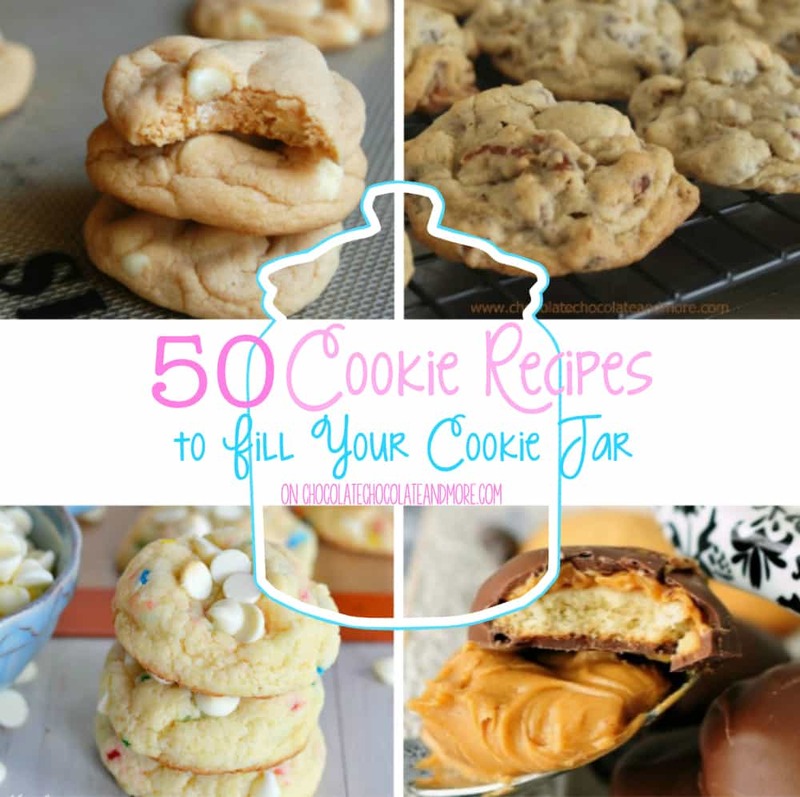 This recipe will make about 4 dozen cookies.